Market is a mechanism of commodity-money relations that operates according to relevant laws, connects buyers (demand representatives) and sellers (supply representatives), and forms buy/sell prices. The price acts as a main landmark for the market relations. It holds (in accordance with the labour theory of value) the monetary value of goods as a product of labour . Monopolistic competition with open pricing based on the price competition, the so-called competitive market. In this market seller's income is decreased with the increase of goods' sales price, and vice versa. The income elasticity coefficient from the sales price is always negative, and the profit varies with the change of sales price following the complex pattern. This market type is common for various goods and services markets. Perfect competition where sellers are not in position to change the goods' sales price due to a high competition among sellers. Any attempts to change the price force the participant to exit the market. This type is most common for wholesale markets. Monopolistic market where a seller or a group of sellers have an opportunity to set the goods' sales price that is most profitable for them. Their revenue and profit is increased according to the increase of goods' sales prices, and, therefore, the elasticity coefficient in such markets is always positive. The researchers felt that the price has a paramount role in the market management mechanism, which is known as 3 axioms of Dow Theory . It still remains unknown, how the price manages to control the market mechanism and form its sole correct value as a market price level that shapes the market in a wonderful and mysterious manner that is not yet understood. Discover the role of price in the market management mechanism based on the principle of balancing interests of its participants to ensure market stability. Identify the types, formation nature, reasons of appearance and the extent of interaction between different levels of real and virtual market prices. Identify the market type by the nature of changing the current price and by learning the mechanism of their interconversion. Establish a common pattern between the market of services and goods and the Forex market. Find out the reasons of formation and change of trends. Generate signals for market entry and exit. Establish the principle of the Forex market operation. Study the relevance and potential of applying the market theory conclusions in order to create and use various indicators and Expert Advisors for trading. We are going to begin the development of the market theory by identifying the interests of its participants. It is natural to assume that the market participants are driven by the opportunity to gain profit or other benefits to satisfy their material and spiritual needs. Therefore, we will choose it as a factor for maintaining the balance of interests for all sides of the market — both sellers and buyers. Since in the market conditions profit mainly depends on the goods' sales price, first we are going to identify this dependence. As simple and obvious this formula may be, it also includes the dependence from the goods' sales price (Ps) in the implicit form, which complicates the analysis, if Ps changes. Let's try to obtain the dependence of return on the sales price in the explicit form. Therefore, in the market conditions the dependence of total sales (St) on the sales price (Ps) is linear, and now the coefficients in equations (2) and (3) acquire a clear physical meaning, namely, the S coefficient is the maximum virtual sale achieved by the unlimited decrease of Ps to its insignificant values, and it indirectly reveals the potential market demand for these goods. We will mark Y coefficient as the elasticity of total sales from the goods' sales price, which numerically reveals the change of total sales when the goods' sales price changes by unit in the payment currency of goods' price. 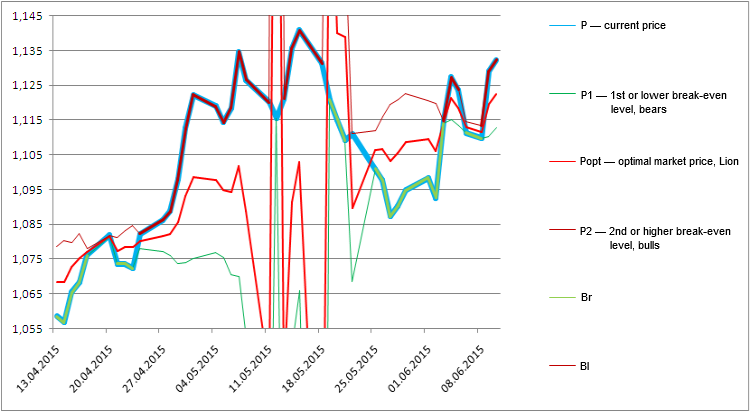 Obviously, if there is a competition in market conditions, the elasticity always holds a negative value, i.e. Y ≤ 0 and the increase of sales price (Ps) by unit leads to the decrease of total sales by Y units in the payment currency of goods' price and, vice versa, the decrease of sales price (Ps) by unit leads to the increase of total return by Y units. 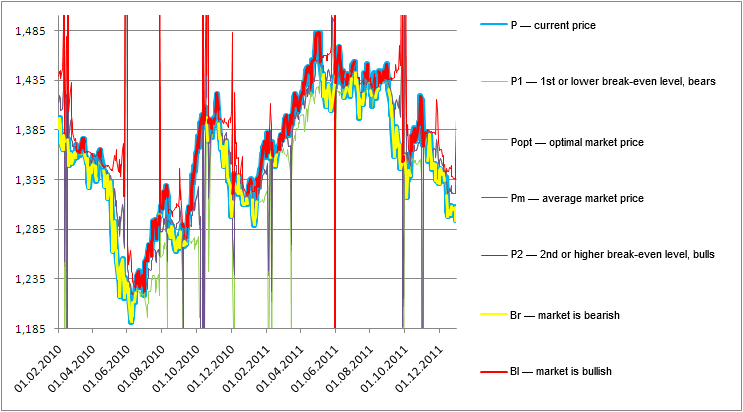 Therefore, the market price (Pm) is an arithmetic average, and the optimal realization price (Popt) is a geometric average price value corresponding to two break-even points. According to the analyzed theory, multiple real and virtual price levels are formed and operate on the market. Let's list them and give a short description to all the price levels. Ps — sales price of goods. Pl — maximum sell price — when exceeded, goods on the market can't be sold, calculated as (6). We will use values of price levels and matching of actual and estimated return values as an example, and make sure how accurately the algorithm, which currently analyses the Forex market, describes and analyses the situation of the trading process on the real market of goods and services based on the example of the single entrepreneur analysis. Supposedly, the entrepreneur has purchased the goods at the price Po=100 dollars per unit in order to resell them on the market (in the shop, supermarket etc.). During the first day of trading, while selling goods at the price Ps1=112 dollars per unit, he gained profit of St1=59300 dollars. On the second day he increased the sales price to Ps2=118 dollars and his return amounted to only St2=8800 dollars. Variable costs, including taxes, account for 10% from the income, and fixed costs are located at the level of Cf=200 dollars daily. We have to determine the entrepreneur's return (R) for two trading days, break-even points P1 and P2, maximum values of goods' buy price (Pol), variables (Cv) and fixed costs (Cf) that after being exceeded cease profit gaining, and also to analyze the market in order to determine the optimal sales price of goods (Popt) that guarantees maximum profit (Pmax). Gann Theory is a product of practical study of the model, price and time ratios and their influence on the market. b) corrective section ("Correction") that consists of 3 segments and compensates for the previous impulse movement. Strategy based on the Ichimoku Indicator — associated with "Ichimoku cloud" which is a product of the author's practical research of 30 years. They all have a common feature — the absence of a strong theoretic base showing the real connection to the process of real trading with goods and services. These theories are the result of practical investigations and assumptions of their authors. Furthermore, they are connected with a united idea, namely, the understanding that along the price movement there are some levels and powers affecting its pattern, and the authors have devoted their lives to the frantic search for regularities of forming the indicated levels and forces. Applying indicated theories in the trading practice led to variable success, however, due to the lack of more reliable theories, the researchers aimed only at the positive results, regardless the convention of their application and the actual money loss, explaining this as the "wrong" interpretation on the trader's side or presenting it as the disadvantages of one or the other theory. I am trying to convey the essence of the new market theory that doesn't have any disadvantages listed above. This theory is based on a strong theoretical foundation, with equal elegance it describes the process of real trading of goods and Forex trading on the basis of price interaction between three virtual price levels, that the brightest men dedicated their lives to find, but, unfortunately, never succeeded. Current price level that can become bullish or bearish, depending on the situation. When the market is bullish, the price becomes bearish, and vice versa. Virtual price level is formed by the market, and, like the current price, may turn bullish and bearish, depending on the circumstances. Virtual managing level of the optimal market price — lion level. Virtual managing level of the average market price — leopard level. lions manages the market — beyond market. The future indicator will look according to the charts below. The proposed market theory is based on the pattern analysis for gaining profit, depending on the sales price of goods. It was discovered that by analyzing the market condition, we can estimate the maximum virtual return that indirectly reflects the market demand in these goods, and the elasticity of return towards the sales price which allows to evaluate the maximum level of goods' sales price on the market, named the "market level". As established, a virtual optimal level of goods' sales price, presented as a geometric value of two break-even levels that allows to obtain the maximum profit when setting the sales price at this estimated level, is formed on the market. Furthermore, it was revealed that the income formation is also influenced by the virtual level of the average market price, which is formed on the market and represents the average value of two break-even levels. This level was called the "leopard level". The best results on the real market of goods and services are achieved through organizing trading around the optimal level of the goods' sales price, named the "lion level", which guarantees the maximum return. Commercial organizations may use this article as a guideline for optimizing the trading process. Apart from the real level of actual price, 3 more virtual levels — market, lion and leopard levels — are formed on the Forex market. Price and market levels oppose each other and can take turns to become bullish and bearish. When trading on the Forex market is organized around the first lower break-even level, the price turns bearish and aims to take this level — the market downtrend occurs, and the market level becomes bullish, and vice versa, when it is convenient to organize trading around the second upper break-even level, the price becomes bullish in the attempt to stay at this level, thus the uptrend is formed, and the market level turns bearish. These metamorphoses are organized and managed by the virtual lion and leopard levels. Trading on the Forex market can be organized around the third global break-even level — the lion level, only in exceptional cases. This situation is accompanied with a severe flat market. b) voluntary transfer of the price management from bulls to bears on the lion level. Market and types of markets (in Russian). 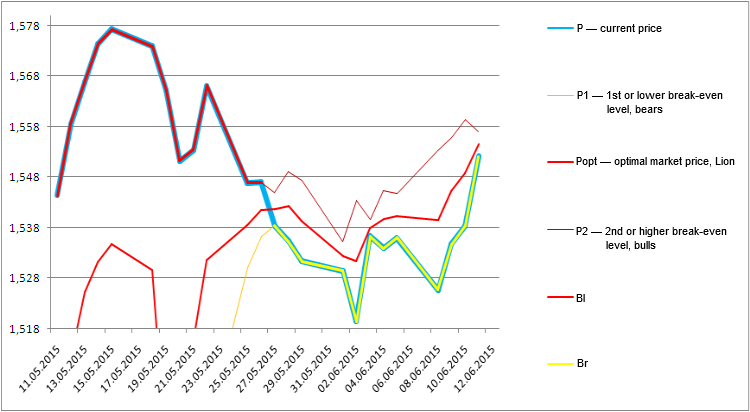 Universal Regression Model for Market Price Prediction. Already exists look in the article the author's profile. What should your program do, if graphic control panels have been removed or modified by someone else? In this article we will show you how not to have "ownerless" objects on the chart, and how not to lose control over them in cases of renaming or deleting programmatically created objects after the application is deleted. This article covers the use of assertions in MQL5 language. It provides two examples of the assertion mechanism and some general guidance for implementing assertions. This article is the beginning of another series concerning development of graphical interfaces. Currently, there is not a single code library that would allow quick and easy creation of high quality graphical interfaces within MQL applications. By that, I mean the graphical interfaces that we are used to in familiar operating systems. In this article we will create the first and main element of the graphical interface - a form for controls. Multiple controls can be attached to this form anywhere and in any combination.